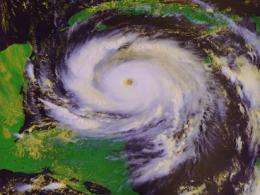 (PhysOrg.com) -- The role of hurricanes in the global climate system has gained interest ever since scientists suggested that strong hurricanes have become more frequent in recent decades and might continue to do so as the planet warms. Because hurricanes are known to influence the oceans and overall climate system, the consequences of the increase in the frequency of hurricanes could reach further. "...scientists suggested..." is an opinion that may be based on an agenda but is clearly NOT based on the facts! So, if there is global warming (any cause) there appears, i.e. the data suggests, to be an inverse relationship between global tropical storm energy and temperature change. We'll have to wait for more data to determine if this relationship holds w/ high probability,...or not. That's the way science works! Scientists suggest a little bit to often lately, are they the new church? I learned scientists only should make reports based on facts and proven calculations, this article is not science.